Wanderlusts travel across the world to explore the hidden layers of history, tradition, culture, religion and civilization of a place. Wait! Did I miss something? Food. Travelling not just relates to exploring a destination for its beautiful attractions and rich historical background, but the delicious food it offers as well. India is one such awesome country known for its diversity in culture, tradition, religion and food! Foodies measure distances to satiate their craving for a different yet sumptuous cuisine. Trust me, in India, you can have the taste of unique cuisines and none will ever disappoint you. If you are among those best combination of a traveller and foodie, tick off this list of best places for foodies in India soon! What could be a better start than the capital city? Sometimes referred to as India’s food capital, Delhi secures the first place in our list for the long list of delicacies it offers to every traveler. Starting from the fine dines at the restaurants in Chandni Chowk to the colorful platters of street food found at every corner, make sure you don’t miss out anything. 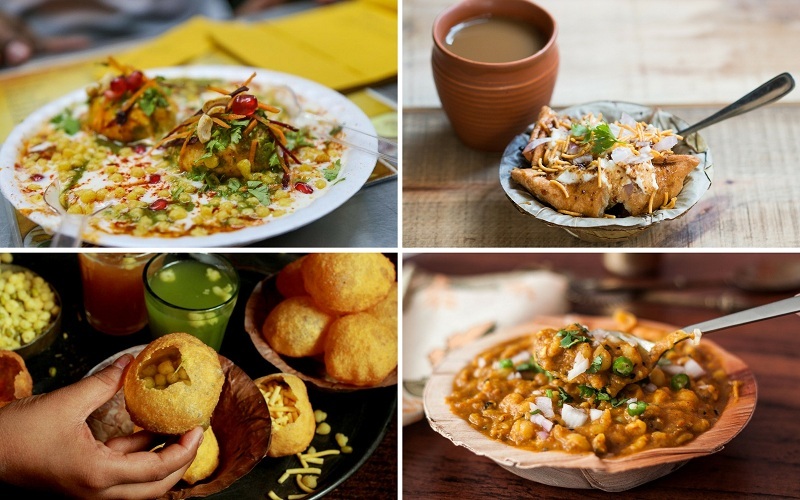 Try the mouth-watering Golgappe, Dahi Bhalle, Daulat ki Chaat, Papdi Chaat and Chhole Bhature. That delectable taste of soft bhatures and spicy chhole is going to stay with you for long. Be it the ghee-dripped baatis, yummy varieties of chaat or the winter specialty Malaiyo, Banaras is a paradise for every foodista. Prepared from flavoured milk, the rich creamy goodness of Malaiyo is a savory to delight you in the chilling winters. Gadaulia and Chowk are the best stops for foodies and do have the alluring experience of Subah-e-Banaras at the Ganga ghats. Non-vegetarians don’t be upset. The city serves sumptuous Achari Murgh and Chicken Tikka that you are going to love for sure. Most Bengalis are found to be foodies and there’s a reason. The City of Joy, Kolkata, is one of the popular cities known for food as it offers a wide range of delicacies for both vegetarians and non-vegetarians. The delicious Hilsa (kind of fish cooked in mustard sauce), Dhokar Dalna, and scrumptious desserts like mishit Doi are the best picks in the city. Bengali cuisine is known to make anyone drool, try it to believe it. When the topic is food, how can we miss the Mayanagri Mumbai? From the avant-garde restaurants to the budget street food in Chaupatty, you get all that you want to eat. Also called the king of street food in India, Mumbai offers some of the best food items, you could not even think of. Stroll down for a walk at Juhu Choupatty or Marine Drive and taste the yummy Vada Pav, a famous street food items believed to be introduced in Mumbai. Also try the spicy Dabeli with a touch of meethi chutney, kheema pav, bhel puri, Misal pav and the list goes endless. Book last minute flights to Mumbai and satiate your taste buds like never before. Eat like a ‘Nawab’ with ‘adab’. Doesn’t it sound interesting? The city of Nawabs in Uttar Pradesh, Lucknow is known for the delicious and rich food it offers to a travaler which makes it one of the best places for foodies in India. Go drooling over the delectable kormas, sheermal and galouti kebabs. The most famous is the Hazratgunj’s Tund-e-kebab, minced lamb and biryani. When in Lucknow, do not miss out this. You must also try the malaidaar kulfi as a perfect dessert after the meal. Hyderabad, the city of Nizams is globally famous for biryani that you can get anywhere and everywhere, be it a roadside dhaba or a luxury restaurant. The Hyderabadi cuisine is a blend of Andhra, Mughlai and Turkish cuisines. To have a scrumptious meal of biryani, head on to the Shadab for muton and chicken biryani, Sarvi for chicken drumstick biryani, Bawarchi for mutton biryani and Café Bahar for haleem and biryani. Also try the local delicacies like keema samosa, lukhmi (mutton minced dish), paaya (stew of beef or trotters) and the dessert sheer khurma (vermicelli pudding). Hyderabad is a food hub for foodies, mostly the non-vegetarians. If you have already booked business class flights for the upcoming business event in Hyderabad, you have a great chance to have the delicious Hyderabadi food. If there’s any place that can make delicious vegan food, it is this best food state in India – Gujarat. Ahmedabad claims to hold great fame in offering the palatable Gujarati snacks like khakhra, farsan, khaman dhokla, thepla, dalvada undhiyu and khandvi. Not just snacks, there are some of the famous fine dining restaurants and cafes. From authentic regional cuisines to international delicacies, a foodie can get their hands on almost every kind of food in Ahmedabad. Do you have different food habits, someone we might call an omnivore? If you are a traveler out on food experiment in India, head towards Malabar in Kerela. You can have the best variety in terms of taste – Appam, duck preparations or Beef Kurumulakittathu, each of the dishes is scrumptious undoubtedly. Have a date with the coffee in Malabar. The aroma would definitely stay with you for long. Most of us know Amritsar for the famous Golden Temple and Wagah Border, but the city has a lot more to offer, especially for foodies like you and me! It is one of the best food destinations in India among the enthusiastic travelers who explore food and beverages. Try the Amritsari Kulchas, Kesar Lassi and other palatable Punjabi Cuisine. Do not skip the Makke di Roti and Sarso da Saag at the street vendors all-round the city. Have a thing for Tibetan and Chinese cuisine? Explore the taste of North-East India. Shillong in Assam has some of the amazing traditional delicacies of the north-east that every foodie should give a try. If you love momos, this is the place for you. In the chilling cold, try the steamy chicken, veg and pork momos at the Broadway Hotel. Do not forget to taste Thukpa, chow Mein and various khasi delights in the city. India is a country with diverse food options from South to North covering all the areas in between. These were some of the many best places for foodies in India, there list is much longer. Top 8 Hiking Tips and Tricks to Prepare for a Hiking Trip!